Acknowledged author Mark Rothstein wrote Employment Law Cases and Materials (University Casebook Series) comprising 1254 pages back in 2015. Textbook and etextbook are published under ISBN 1609304497 and 9781609304492. 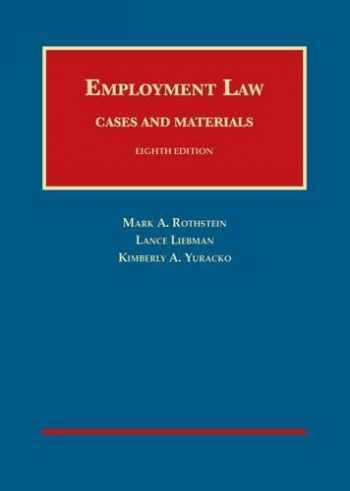 Since then Employment Law Cases and Materials (University Casebook Series) textbook received total rating of 4 stars and was available to sell back to BooksRun online for the top buyback price of $86.50 or rent at the marketplace. This popular casebook provides a comprehensive overview of the constitutional, statutory, regulatory, and common law principles of employment law. The doctrinal development of the law is assessed in light of contemporary economic, technological, social, and political conditions. The new edition contains a detailed discussion of health care reform legislation and the role of employers in financing and administering employee health plans. It also considers such important issues as sexual harassment, workplace privacy, wrongful discharge, and employee pensions. Among the statutes covered by the casebook are Title VII of the Civil Rights Act of 1964, Age Discrimination in Employment Act, Americans with Disabilities Act, Family and Medical Leave Act, Employee Retirement Income Security Act, and Worker Adjustment and Retraining Notification Act.